Check out this great video tutorial that Sawah shared on my Facebook page!! Love it!! 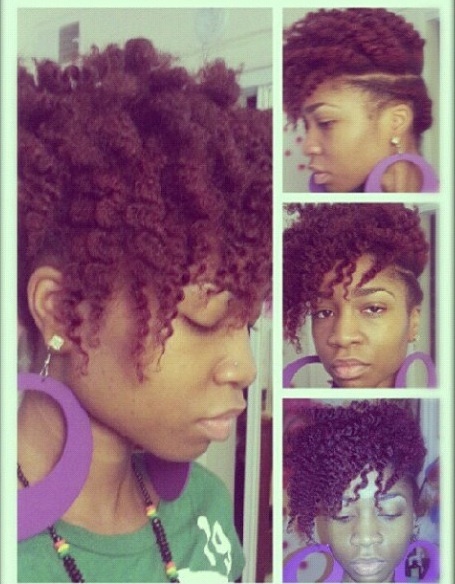 Reminds me of my My Cinnabun, but this is a great way to modify the style to make it work for shorter hair!! Love the extra little bits of “flare” that she added to finish off the style!! Working with short hair can be a challenge at times. 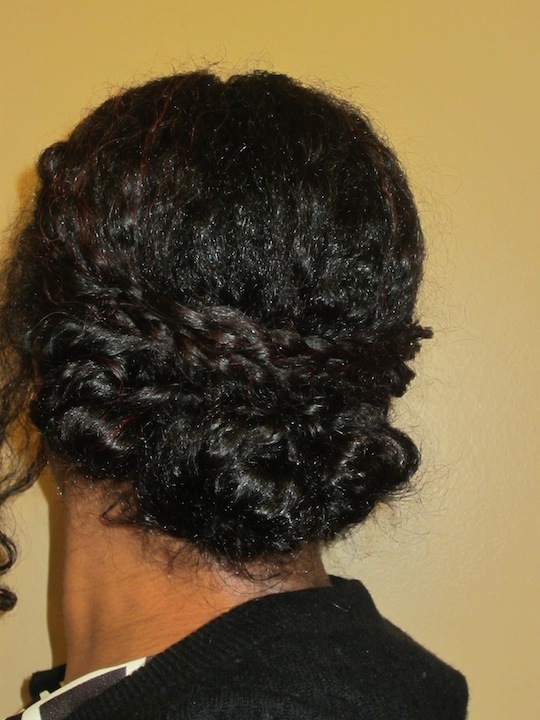 Here is a simple style that you can try to create a look of fullness to your hair. This style is not only great for work, but also for special occasion. 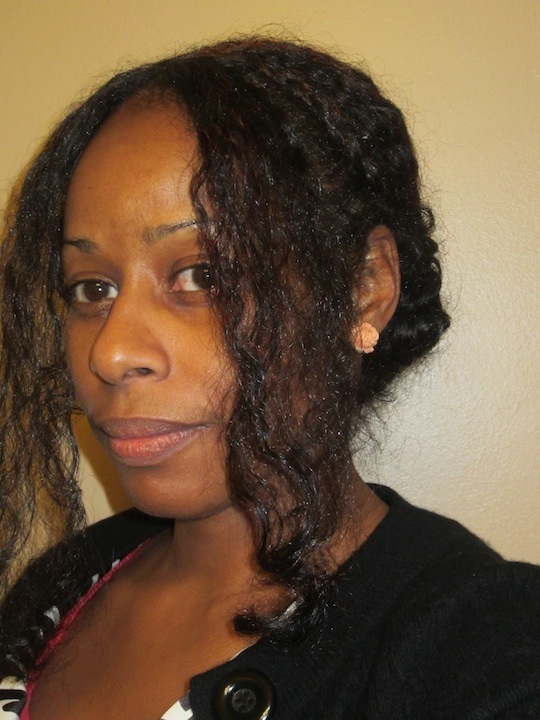 The great thing is that it is a great protective style that takes less than 5 minutes to create. 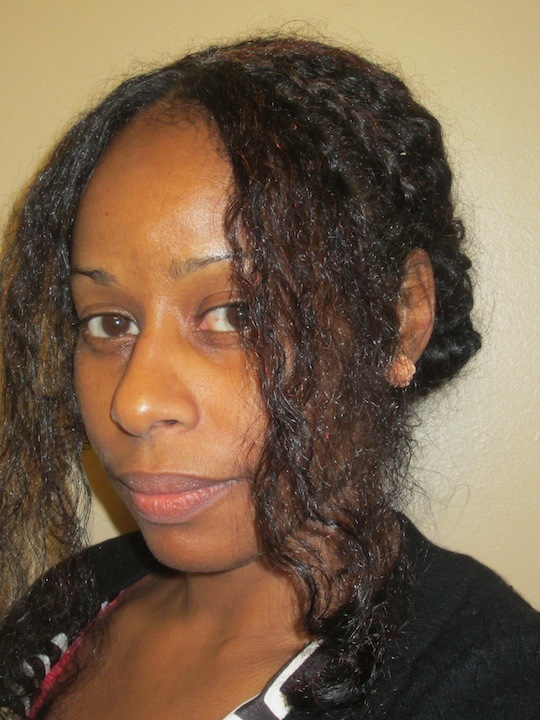 If you are transitioning, this is also a GREAT style to hide the relaxed ends. Sawah lady!! Your skin? Flawless! Your eyebrows? Perfection! The shine and health of your hair?!?! Fabulous!! Am I right or am I right ladies?! 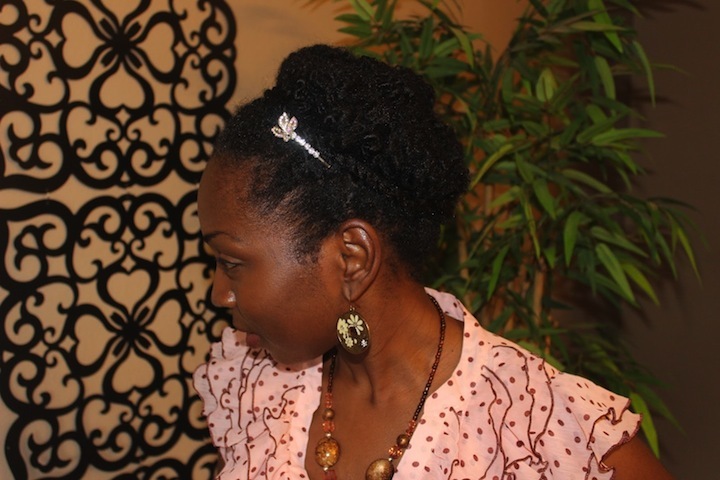 Here is another super cute faux/frohawk great for medium or long hair, I think! And yes, that is all her hair! At first I thought braiding hair was added because the YouTuber’s hair looks to be about armpit length straight, but this style is achieved with big pin curls and a little creative wrapping!! Check it out! Loving her hair color too!! Okay, I saved this pic within the first week of joining Instagram for a Style Inspiration feature! I know that I shared it on Facebook, but somehow never managed to post it here!! Well, time to rectify that oversight. 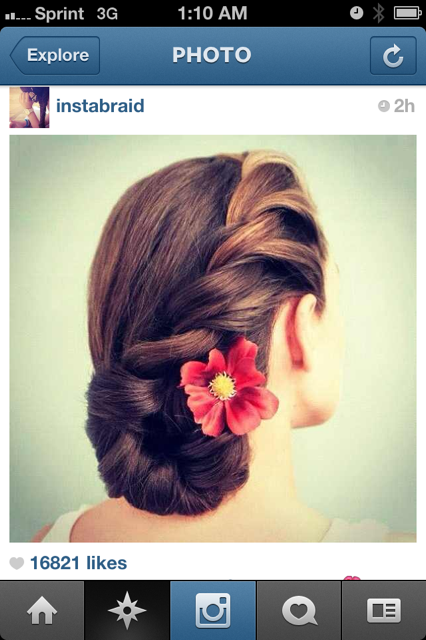 How HAUTE is this updo by @karmbaby?!?! I love the look of undercuts, but would never do it as my hair is not thick enough to sacrifice sections of hair! This is an awesome way to fake the look, without sacrificing the hair!! Love it!! And her color is FIYAH!! Want to see and learn more about Karmbaby? Then check out her YouTube Channel here! Would you rock the faux “undercut” look? 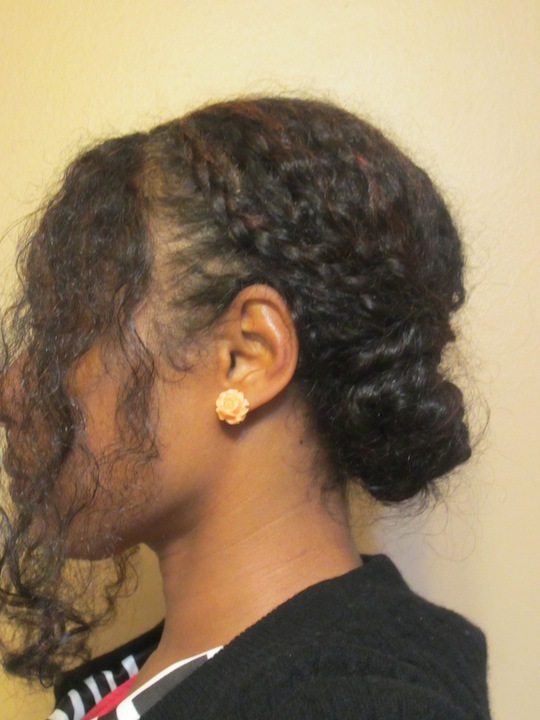 I know that my buns have been VERY boring and repetitive over the last two months of the Hairscapades Bunning Challenge. I mean, I’ve been taking the quick and easy route for real … either due to lack of energy, desire and/or time. So, when I came across this next video and channel on YouTube over this past weekend, it was right on time! I finally felt inspired to try something a little different! 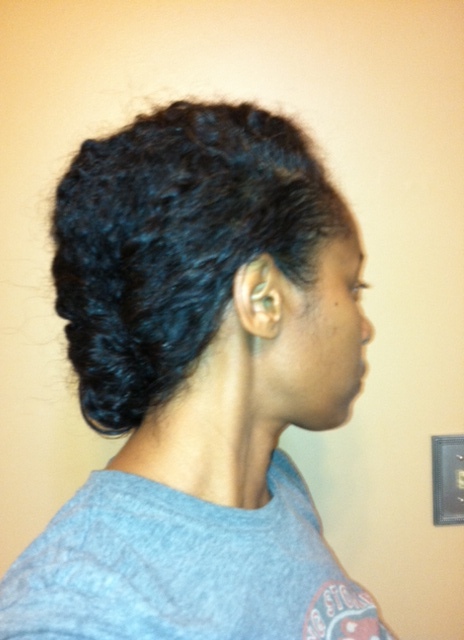 I decided to try the first mini bun style yesterday morning since my hair was nicely stretched. I tried to set the front on big aqua perm rods, but didn’t have much time and it ended up being a little frizzy, lopsided and wonky. But, overall, me likey!! How do get out of a styling rut? What/who do you turn to when you need styling inspiration? My sister sent this to me the other day! A little accessorizing inspiration for my bunning challenge ladies or, you know, those of you who just happen to wear buns ;)!! I particularly LOVE the idea of the hair bow clip!! 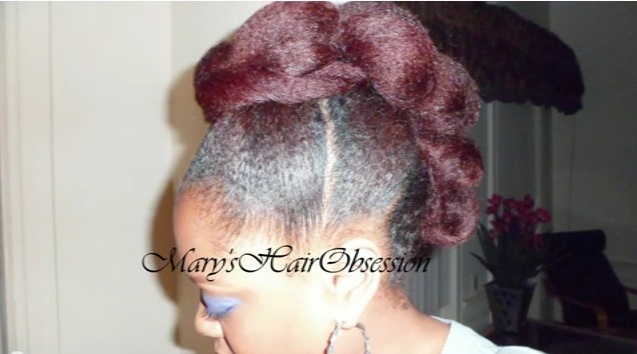 I’ve seen the hair bow style that some of the ladies have been rocking popping up a lot lately. And, although I think it looks very cute on them, don’t see myself trying that one! 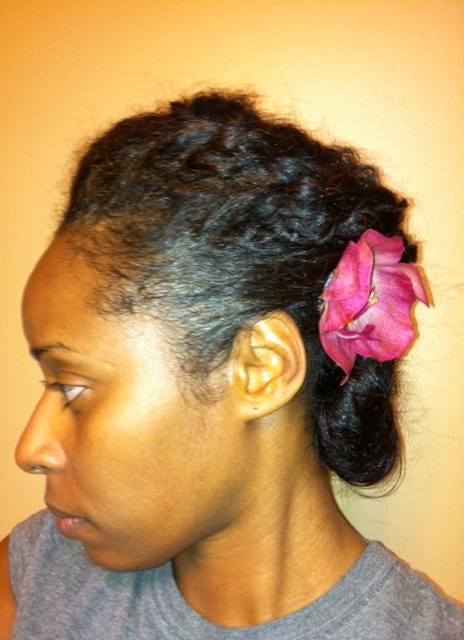 But, the hair bow clip is a quick and easy way to get a little of that look!! Now, I just gotta figure out how to make my own with faux hair that looks like my natural hair!! Pretty sure that I have some curly/wavy synthetic hair hanging around that I can use to give it a go! You know that I’ll share if it works out ;)! 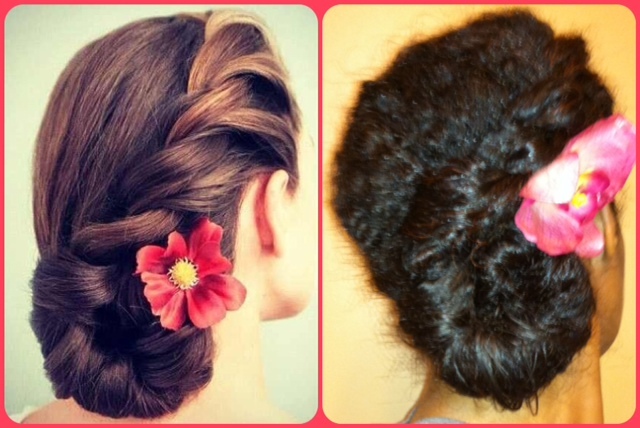 Would you wear the hair bow style or the clip? What is your favorite way to accessorize a bun? (Mine is with hair flowers!! No surprise there, right ;)?! 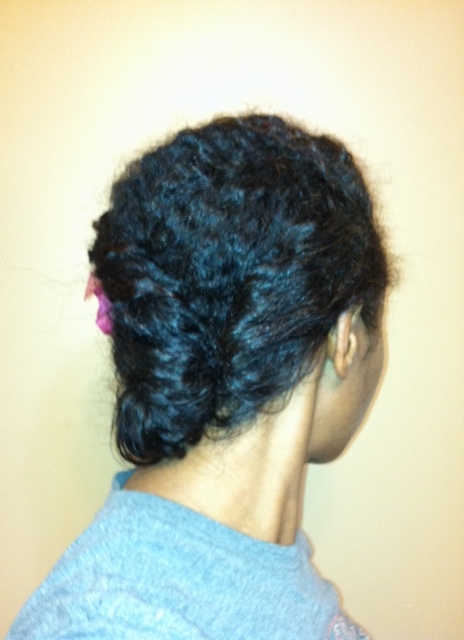 Single Flat-Twisted Bun: My Turn!! I did it!! 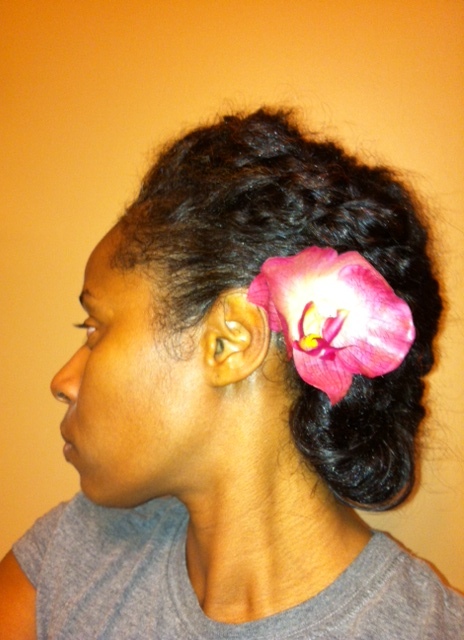 Remember this Single Flat-Twisted Bun Style Inspiration post from the other day? Well, my girl Rece of A Hair Story tried it after I text her a pic of it. Check out her results here. So pretty right?!?! So, I had to give it a whirl myself on Tuesday night !! What do you think? It’s not perfect. I think I should have taken the flat twist further down the middle and then to the opposite side of my neck before making the twirly bun. But I didn’t think it was too bad for my first try, especially since I don’t really know how to flat twist well!! I would really love to try this on straight hair or a light blow-out! Anywho, here are a few other pics of my first attempt at the style! And after taking these pics and posting a collage on IG … I proceeded to take it down and put it in a simple bun for bedtime!! LOL!!! I know ;)!! Anywho, the next morning I released the bun to do a little scalp massage with a hair thickening product that I’m trying (IF you follow me on FB, IG or Twitter, you probably already know what that is ;). If you don’t, you’ll have to wait until next week to discover what it is ;)). And this is what my hair looked like yesterday morning before I promptly and quickly bunned it with a hair fork for work, because I didn’t have time to try to do the style again! I ♥ ♥ ♥ big hair! Too bad I had to put it away! Actually, I can’t stand all this hair around my face during work. It’s too distracting. But, maybe this weekend she can come out and play ;)! So, have you tried any new styles lately? Are there any techniques that you are trying to master or learn? How frickin’ pretty is this? And, it looks kind of simple! 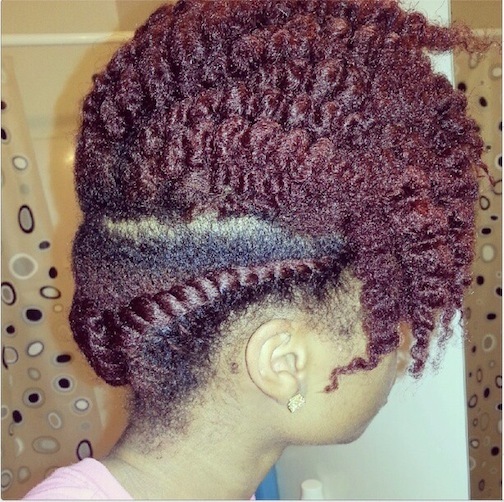 I think it’s a two strand flat twist that stops around the nape and the remaining hair is twirled and “folded” into a bun. So, I had saved this pic to share on IG when one of our Hairscapades Bunning Challenge ladies, @Chelle32675 , posted THIS pic!! I was like, “Are you kidding me?!? !” How awesomely serendipitous is that?!! And guess what? It gets even better! She didn’t see the pic I was planning to share, she watched this YouTube tutorial! One thing that you may have noticed is that the bun is rolled under the flat twist, outwards toward the ear in the first pic. 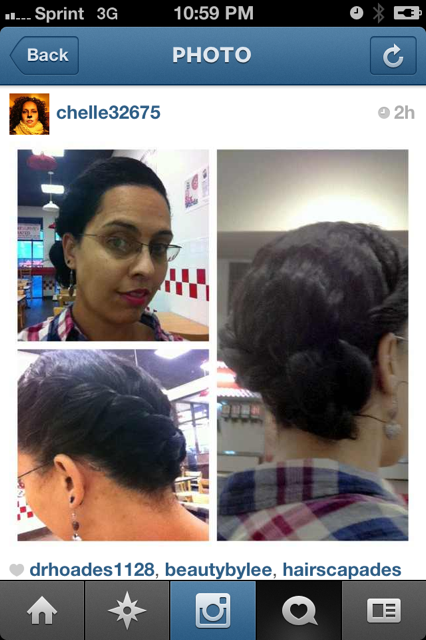 In Chelle’s pic and the tutorial, it is coiled on the opposite side, inward and over the flat twist. The cool thing is that this is a style that can be modified and worn on different length hair! It may look slightly different when done on short versus medium length versus long hair, but it looks lovely on every lady, I think. 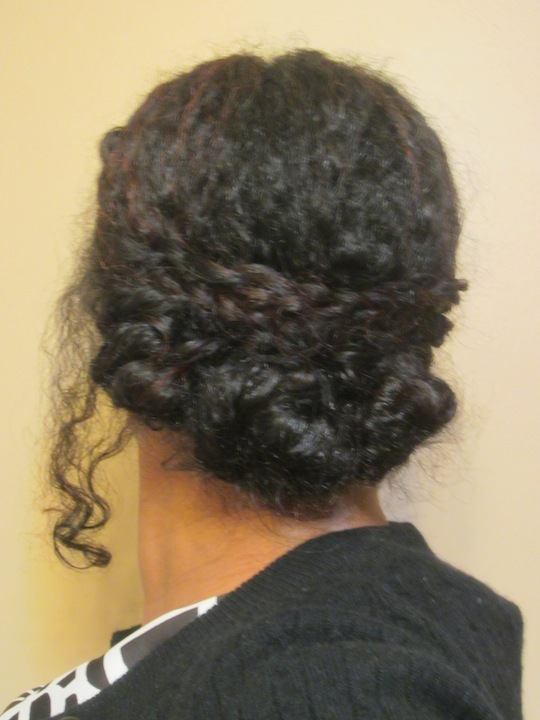 Now, if I would get off of this computer and hop in the shower to wash this mop, I might be able to set my hair in a braid-out so that I can try to do this bun tomorrow morning! Hmmm … that may be an aggressive timeline … maybe tomorrow night! lol ;)!